Sorry for forgetting to get a post up last night. I fell asleep watching Extreme Homes and just woke up. AWESOME!!! I’ll posts some photos in a bit. Off to read Brad’s site. 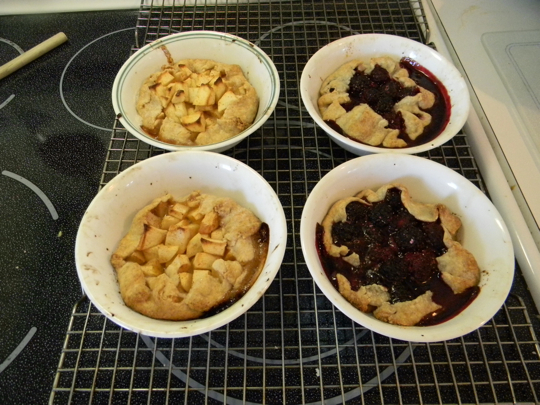 Four cereal-bowl pies. Two apple, two blackberry. Stuffing, which I make from whatever bread happens to be handy around the house. 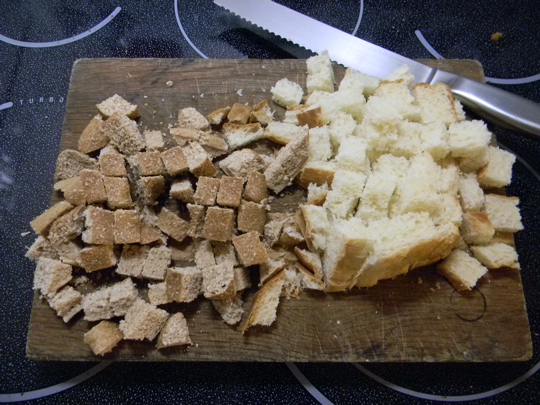 This year it was English Muffin bread, a whole wheat bagel, and some pumpernickel bread (not shown). 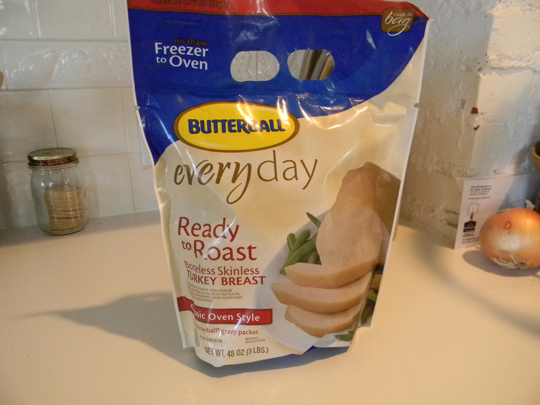 Turkey, in a freezer-to-oven contraption. It baked in a inner roasting bag, which was freaky but worked out fine. There was also a green bean casserole, some undercooked mashed potatoes (my fault) and copious amounts of gravy. Mmmmmm…… looking forward to being sick of leftovers…. The turkey took much longer to cook than it said on the bag, and we were starving, so we each ate a pie before dinner. When the food was actually done we were stuffed, so we just made up little plates to nibble on while watching ‘Brave’ on iTunes. Lesson learned: next year just make pie and buy two Swanson dinners. It sounds like a delicious Thanksgiving meal! And I’ve never seen that Butterball turkey before! So it made lots of juice for gravy or did you make some other kind of gravy? Now, do share about the cereal bowl pies. I need to know how to make those. The gravy was less than stellar. I started my roux-and-chicken-broth regular, and should have just added the drippings from the bag. The turkey came with a gravy packet that I added, and the taste is a little weird. Oh well, it’s gravy.